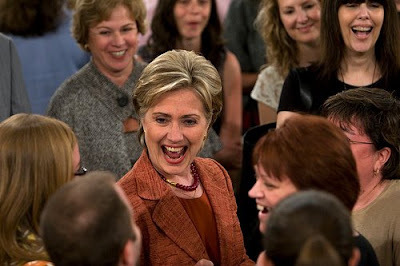 Heidi Li's Potpourri: Senator Clinton is not "subdued" - nor can she be! Senator Clinton is not "subdued" - nor can she be! I cannot be bothered to note which major newspaper just headlined a story with referring to Senator Clinton and her audience on the campaign trail as "subdued." (If do want to see this, google away and you'll find it easily). Look left and you will see a photograph taken last night in Portland, Oregon, just following a televised town hall event. Does this woman - or the studio audience participants - look subdued? Photo via The Oregonian, which has more. And, my explanation for this answer is that the media, Obama, and the DNC are the ones who are subdued.